See all the related commits, branches and pull requests in an issue. Create Git branches from within Jira Software. Transition issues from within Bitbucket Server. Use issue keys in Bitbucket Server markdown. See the details for issues in Bitbucket Server. See issues related to Bitbucket Server commits and pull requests. 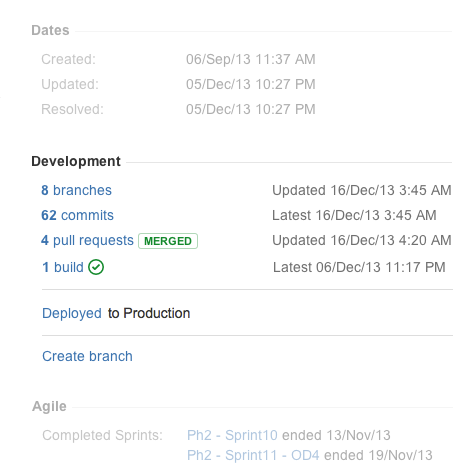 Check commits, branches and pull requests for an entire version within Jira Software. You can also use Jira Software for delegated management of your Bitbucket Server users. See External user directories . Your Bitbucket Server administrator needs to set up linking with Jira Software before you'll see these work. The Release Hub shows the progress of a version, so you can determine which issues are likely to ship at a glance. With Jira Software and Bitbucket Server connected, the commits related to each issue are shown, helping you to spot potential development issues that could cause problems for a release. When you are ready, you can also release the version from the Release Hub, which marks the version as complete, moves incomplete issues to other versions, and triggers release builds (if Jira Software is connected to Bamboo). To view the Release Hub (with the project sidebar enabled), navigate to a project, click on Releases, then select a version listed. See Checking the progress of a version for more detailed information about using the Release Hub in Jira Software. Bitbucket Server events are published by default. We recommend that you use the latest version of Jira Software to ensure that duplicate events are handled correctly. Jira Software automatically removes duplicate commit events and duplicate branch creation events. Get visibility into the Bitbucket Server branches, commits and pull requests related to work on an issue, right in the context of the issue in Jira Software. Click the links in the Development panel to see details of the work that's been done. You can start creating a pull request from the Commits details dialog, or click through to see a changed file, or the full commit, in Bitbucket Server. You can start creating a branch from an issue. This gives you a faster workflow from picking an issue to starting coding. Bitbucket Server will suggest the branch type and branch name, based on the issue type and summary – you can change these, of course. Click on a step and complete the fields as required. If there are custom fields that are unsupported by Bitbucket Server, just click Edit this field in Jira to transition the issue directly in Jira Software. Bitbucket Server can link to more than one Jira Software server at a time, so different teams can work with their own projects in different instances, or a single team can link to issues across multiple Jira Software servers. Read more about linking Bitbucket Server with Jira Software. Click on the linked key to see details for the issue.